OSWEGO, NY – In recognition of Breast Cancer Awareness Month, Oswego County Opportunities’ Cancer Services Program Partnership has joined SUNY Oswego to assist them in their efforts to raise awareness of breast cancer in Oswego County and encourage faculty, staff and community members to receive the cancer screenings they need. 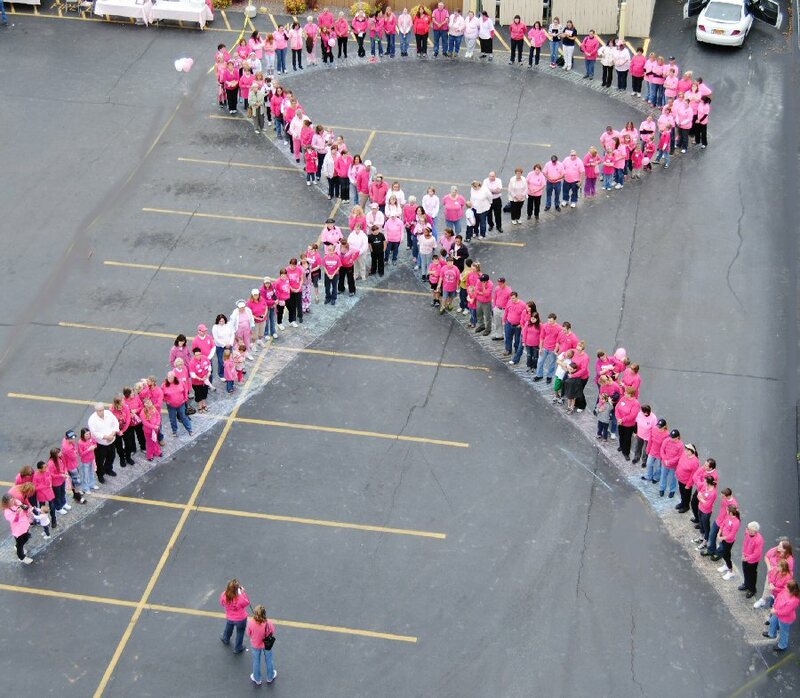 More than 150 community members came together last year, dressed in pink, to raise awareness of breast cancer by forming a human pink ribbon in recognition of Breast Cancer Awareness Month. This year the community is invited to join OCO Cancer Services Program Partnership in front of Culkin Hall on the SUNY Oswego Campus for the fourth annual Human Ribbon Celebration. Carolyn Handville, coordinator for the Cancer Services Program Partnership, has made appearances throughout the community disseminating information on the free clinical breast exams, mammograms and other free cancer screenings including pap/pelvic exams and colorectal cancer that are offered through the CSPP. “Our goal continues to be to raise awareness and register eligible community members who are both uninsured and between 40 and 64 years of age into the program to obtain their free screenings. October provides added opportunity for the Cancer Services Program to promote the services offered through the program while everyone is thinking about breast cancer and to support the many community members in Oswego County that have been affected by this disease,” said Handville. The Cancer Services Program and SUNY Oswego’s efforts to raise awareness of breast cancer will culminate on October 25 when they form the fourth annual Human Pink Ribbon in Oswego County. Handville is asking community members to get their pink on and join them at 11 a.m. that day in front of Culkin Hall, on the SUNY Oswego campus, (enter main entrance of SUNY Oswego from Route 104 and follow signs). Parking without permits will be available in Lot #32. The Cancer Services Program’s Pink Ribbon ceremony will begin at 11 a.m. in front of SUNY Oswego’s Culkin Hall. There will be free refreshments and drawings for door prizes. The formation of the Human Pink Ribbon will take place at 11:30 a.m.
“I invite community members to join us as we support men and women throughout the county that have been affected by this disease, raise awareness of breast cancer in Oswego County and spread the word of the importance of regular cancer screenings,” added Handville. For more information on Human Pink Ribbon celebration or the OCO Cancer Services Program Partnership, contact Handville at 315-592-0830.